To Cite: Ghanbari-Niaki A, Haghshenas -Gatabi R, Fathi R, Saeidi A. 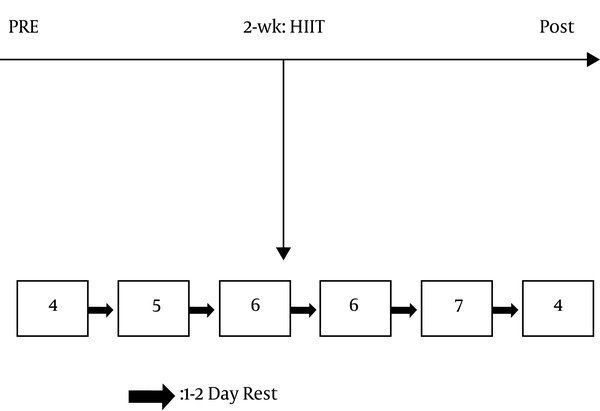 The Effects of a Short-Term High-Intensity Interval Training (HIIT) on the Levels of Serum Hypoxanthine-Guanine Phosphoribosyltransferase (HGPRT) Enzyme and Some Variables of Purine Nucleotide Cycle, Ann Mil Health Sci Res. 2016 ; 14(3):e13449. doi: 10.5812/amh.13449. Background: The enzyme HGPRT 5-phosphoribosyl converts to hypoxanthine or guanine to build up IMP or GMP as an ATP and GTP precursor in the purine nucleotides salvage pathway. This enzyme is most active in the liver, blood cells, nervous system, and skeletal muscles. In fact, the normal activity of this enzyme is involved in the salvage of 90% of free nucleotides and thereby contributes to the economy of purine in cells. Minor decrease or defect of this enzyme results in the increased xanthine, uric acid, and oxygen free radicals. Reports suggest the relationship between this enzyme and the level of physical preparation, antioxidant capacity, and low blood uric acid levels in active individuals. However, the effect of different types of exercise, especially high-intensity intermittent exercise on this enzyme is not clear. Objectives: The present study aimed to investigate the possible compatibility of this enzyme and some purine nucleotide cycle variables in a short-term high-intensity interval training. Methods: 18 healthy, untrained, male, eligible volunteers (based on their age, height, and weight) were randomly divided into control and training groups. The training group rode the bicycle ergometer with maximum intensity for 2 weeks (3 sessions per week) with 45-second repetitions and a 4-minute rest between the sets. Blood samples were collected for measuring HGPRT, hypoxanthine, xanthine, and uric acid before and 48 hours after the last training session, and data were analyzed using analysis of covariance at alpha level of 0.05. Results: A significant increase was found in the levels of hypoxanthine (P = 0.001) and xanthine (P = 0.001) while a statistically significant reduction was found in the level of uric acid (P = 0.02). However, after training, the HGPRT serum level did not increase significantly (P = 0.386). Conclusions: The results suggest that this short-term program was able to improve the variables involved in the purine nucleotide recycling pathway, and probably led to maintaining the balance of total nucleotide pool. Adenosine triphosphate (ATP) and guanine triphosphate (GTP) are two high-energy phosphate compounds, which play different roles in the cell biological processes. Of course, this is ATP that is known as the unique energetic cell that, compared to other high-energy bonds, is the only and the best option for contraction, power generation, and muscle mechanical work (1-3). However, limited capacity of tissues to store cellular ATP and dependence of changes in metabolism on cellular energy charge have made the necessity of enriching this valuable resource life from various metabolic pathways and non-phosphate sources inevitable (4, 5). Purine nucleotides including ATP are biosynthesized in different ways. Denovo pathway (reproduction) and salvage pathway (rescue) are two methods of nucleotide synthesis. In the Denovo pathway, nucleotide bases are made from a combination of simpler materials such as CO2, glutamine, aspartate, and glycine (3). In another procedure, known as salvage reaction, the loss of purine bases is prevented and purine derivatives return to purine cycle nucleotides to maintain energy charge at a normal level. Hypoxanthine is the final product in the adenine purine nucleotides’ salvage pathway, so that if it changes to xanthine by xanthine oxidase in the course of oxidation, purine will be lost and thereby excretes from the body in the form of uric acid (6). Hypoxanthine’s return to the cycle through Hypoxanthine-guanine phosphoribosyl transferase (HGPRT) enzyme and the activity of this enzyme can have an important role in maintaining ATP and cellular energy charge. Moreover, the activity of this enzyme can prevent the formation of free radicals that are generated after the demolition of hypoxanthine (6, 7). HGPRT activity in the adenine pathway converts hypoxanthine into IMP, and similarly results in the conversion of guanine to guanine monophosphate (GMP) in the guanine pathway (7). The deficiency of this enzyme can produce too much uric acid and thereby results in diseases such as pre-mature gout or kidney stones; the complete deficiency of this enzyme may also lead to the Lesch-Nyhan syndrome (7, 8). Uric acid is the final product of purine in human, known as an endogenous scavenger, which is responsible for much of the body antioxidant capacity against free radicals and radical damages (7). Several factors such as exercise and physical activity affect the levels of uric acid and other variables of purine nucleotides so that, through compatibility with exercise, the HGPRT enzyme activity increases, and ultimately lower levels of uric acid, plasma xanthine, and hypoxanthine plasma are seen in individuals, particularly among trained individuals who are most compatible with exercise compared to less trained individuals (9). Today, with the mechanization of human life and the lack of physical activity, the importance of exercise and physical activity for a healthy life is emphasized. On the other hand, today, lack of time and busy schedule is one of the most important human concerns. As a result, there is a need for some forms of trainings that can lead to more metabolic and cardiovascular changes in short time. These activities are referred to as high-intensity interval training (HIIT) that has attracted the attention of sports scientists (10). Recent evidence suggests that this form of exercise is more enjoyable than regular exercise with moderate intensity (11). HIIT brings about higher intake of energy for the body compared to uniform low-intensity training. Although higher intensity training increases carbohydrate intake, evidence suggests that muscle adaptation caused by HIIT leads to more fat oxidation in people adopted to this type of training (12, 13). With the above-mentioned benefits, on the one hand, and due to the lack of a study conducted exclusively to investigate the salvage pathway of purine nucleotides cycle in a short-term HIIT, on the other hand, as well as the lack of a study addressing this form of training with different durations, except the traditional 30-second Wingate Test, and more importantly, due to studies conducted on purine nucleotides cycle that seems mostly focused on non-intensive and endurance sport activities, lack of investigation on the purine nucleotides cycle is evident. Therefore, this study aimed to investigate the effect of 45-second high-intensity interval training with bicycle ergometer on variables of high-purine nucleotide cycle. 18 healty male students selected from Mazandaran University (non-addiction to drugs and alcohol, no history of renal, hepatic, cardiovascular diseases, diabetes, and no injury or physical problem) were randomly divided into two groups: control (n = 9) and experimental (n = 9) (Table 1). All the participants received a 2-week nutrition record. Also, before the start of the experiment, the participants were reminded not to change their diet and merely use the Mazandaran University food service and not to change their daily activity during the experiment. They were also informed about the necessity and importance of the research. The training protocol was adopted from Burgomaster (2005) (14) with a little change in time so that 45-second periods of high intensity activity were applied instead of 30-second periods (for each bout) on a bicycle ergometer (Lode, Holland) for two weeks, three sessions per week. The training group performed their activities in the 1st session in 4 intervals, which included 45 seconds of maximum intensity pedaling (6% of body weight resistance) with 4 minutes of rest at each interval. The 2nd session had 5 intervals which included 45 seconds of maximum pedaling and 4 minutes of rest at each interval. In the 3rd and 4th sessions, the training included 6 intervals with 45 seconds of maximum intensity pedaling with 4 minutes of rest at each interval. The 5th session included 7 intervals with 45 seconds. The 6th session was performed in 4 intervals with 45 seconds of maximum intensity pedaling with 4 minutes of rest at each interval. The duration of rest between the intervals and 6% of body weight resistance on the bicycle was fixed in all the training stages. The control group did not perform any physical activity and only followed their own daily activities. PRE, Pre Exercise; POST, Post Exercise; HIIT, High Intensity Interval Training; numbers in boxes denote number of Wingate tests completed during each of 6 training sessions over a 2-week period. Blood samples were taken from brachial veins of the participants in the early morning after 12 hours of fasting in two stages: 48 hours before the training and 48 hours after the last training session, and were poured in test tubes. Then, blood samples were centrifuged at 3000 rpm for 10 minutes and after that, sera were isolated and used for analysis. Serum hypoxanthine and xanthine were measured using ELISA method by the Quantitative Diagnostic Kit of SIGMA-Corporation, America. HGPRT was measured between the samples by ELISA method using the Quantitative Diagnostic Kit of CUSABIO company (China) with sensitivity of 0.039 mg/mL. The serum uric acid was also measured between the samples using the biochemistry method of Bionik company (Iran) with sensitivity of 0.0347 mg/dL. All data were analyzed using SPSS version 20 software. To determine whether the data are normal, the Kolmogorov Smirnov test was used. After ensuring about the normality of data, analysis of covariance (ANCOVA) was performed to compare the changes between the groups, and dependent-samples t-test was run to investigate the intra-group changes. Alpha level was set at 0.05. The Kolmogorov-Smirnov test showed that the data have a normal distribution (P > 0.05). The Levene’s test showed that the variances are homogenous (P > 0.05). Statistical analysis did not show any significant inter-group changes in HGPRT serum levels (P = 0.386). Analysis of intra-group changes also indicated no significant differences between the pre-test and post-test values (P > 0.05) (Figure 2). Statistical analysis showed significant inter-group changes in hypoxanthine serum levels (P = 0.001). Investigation of intra-group changes indicated significant differences in hypoxanthine levels in the pretest-posttest (P = 0.002) (Figure 3). $ denotes a significant difference from the control group (between-group difference). * denotes a significant difference compared to the pretest. Statistical analysis showed significant inter-group changes in xanthine serum levels (P = .001). Investigation of intra-group changes indicated significant differences in xanthine values in the pretest-posttest (P = 0.002) (Figure 4). Statistical analysis indicated significant differences in serum uric acid levels between the two groups (P = 0.02). 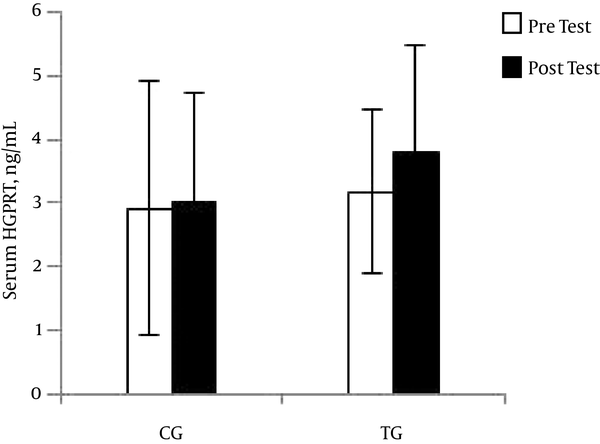 The intra-group analysis showed that there is a significant difference in uric acid in the training group between the pretest and posttest (P = 0.022) (Figure 5). It has been reported that high hypoxanthine is the result of overtraining (15) and its concentration depends on the intensity of sport (16). In extreme speed sport, hypoxanthine can be 40 times higher than its resting values (17). On the other hand, since hypoxanthine indicates ATP energy discharge, it can be considered as an indicator for energy discharge and cellular metabolic stress (18). In this study that showed the significant increase of xanthine and hypoxanthine concentrations, this increase represents the high decomposition of ATP in high-intensity interval activities, and this study is thus consistent with Gerber et al. (2014) and Degoutte et al. (2003) studies (19, 20). Similarly, Zielinski et al. in their research studies reported an increase in xanthine and hypoxanthine levels after the activity of these variables. Of course, important factors such as blood sampling time, type of activity, elite level, and intensity of the activity should be considered. Hypoxanthine slightly increases immediately after the exercise; then, it reaches to its highest value between 30 and 60 minutes after the exercise, and finally decreases to its resting values at other times (21). The study showed that resting ATP did not reach to its resting values even 72 hours after the last training session, and it is the reason for the imbalanced demolition and reconstruction of ATP as well as the acute effects of previous exercise (22). Therefore, in this study that reported high levels of hypoxanthine, it can be concluded that ATP levels have not been renovated yet. 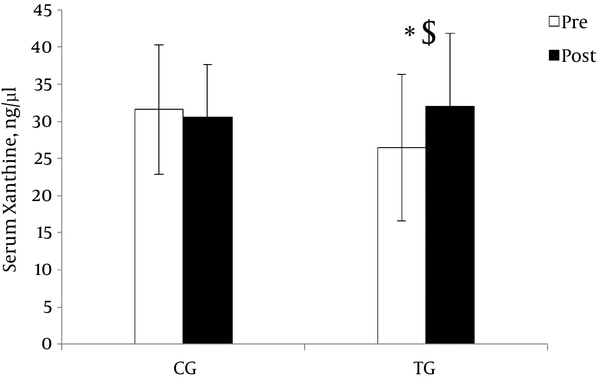 Zielinski (2013), comparing groups of elite athletes and recreational amateurs, showed that elite athletes had a lower increase at hypoxanthine and xanthine rates and amateur and recreational athletes had more purine nucleotides excretion (9). Thus, in the case of the present study in which the participants had not been trained, it is likely that they were not able to recover appropriately during demolition and reconstruction of ATP in the training and recycling period (9). In the present study, a significant reduction in serum uric acid was reported and this finding is consistent with those of Bizheh and Jaafari (1391) because they also reported reduced plasma uric acid after three months of aerobic exercise (23). However, the findings are in contradiction with the investigation of Degoutte et al. (2003) which indicated an increase in uric acid after a training period (20, 23). The reduction of uric acid in the training group may be due to the increased antioxidant enzymes and increased gene expression and their lower reliance on uric acid as an antioxidant (24). In this study, an increase in the amount of HGPRT enzyme was observed and although the rate was not statistically significant, the approximate 18% increase in such a short-term two-week time training is remarkable and can be important in the function of purine nucleotides salvage pathway. In fact, it can be noted that higher HGPRT activity after high intensity training in which the dominant energy is anaerobic is an indicator of a better salvage pathway for reconstruction of adenine purine nucleotides (6). An increase in HGPRT after training has also been previously reported (9, 15, 25). It has also been indicated that in 4 seasons of the annual training cycle (adopted from Bompa, 1999), the match season in which the training moved towards anaerobic, the relaxing activity of this enzyme was high, and this is consistent with the findings of the present study because HIIT activities in which the major energy system is anaerobic can increase this enzyme and as a result, improve the salvage pathway purine nucleotides (26). One of the considerable findings of the present study is the significant increase in hypoxanthine, which indicates breakdown of ATP, and also lower serum uric acid, which is an indicator of inflammation and injury, suggesting that although uric acid is the final product of purine in humans, in this study it not only did not increase, but also decreased (27). An overall look at the research may suggest that exercise stress caused excretion of purine nucleotide and high energy metabolism. 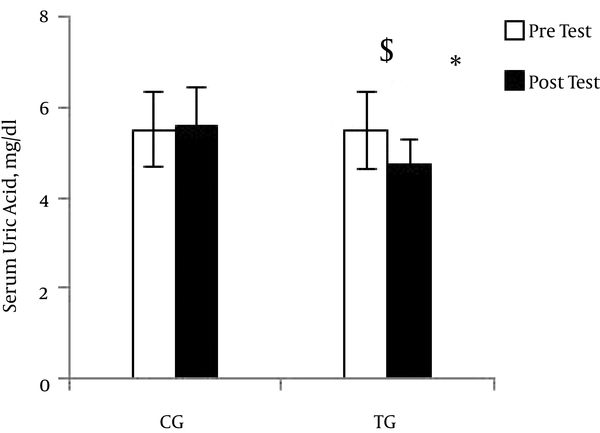 Also, the purine nucleotides salvage pathway was strengthened by the increased HGPRT enzyme, and on the other hand, reduced uric acid led to the less inflammation and damage and overall improved antioxidant capacity in adaptation to HIIT in the short period of this study. Nevertheless, all the aforementioned findings require further research and investigation of xanthine oxidase enzyme and xanthine dehydrogenase in this type of training. In general, the type of HIIT on bicycle ergometer increased hypoxanthine, xanthine, and serum HGPRT in two weeks, and decreased uric acid. Thus, it can be concluded that probably 6 sessions of high-intensity interval training for 15 minutes a day can lead to the increased excretion of purine nucleotides, improved recycling, and reduced inflammation and injury in untrained individuals. This manuscript was extracted from a thesis; therefore, I thank my dear supervisor, Dr. Abbass Ghanbari-Niaki and Azar Midokht Ghahari, pathobiology and medical diagnosis laboratory for performing my laboratory work. Conflict of Interests: We wish to confirm that there are no known conflicts of interest associated with this publication and there has been no significant financial support for this work that could affect its outcome.